TwoCaret cgLinux (carrier-grade Linux) is an embedded Linux distribution designed for building cloud-scale network systems. 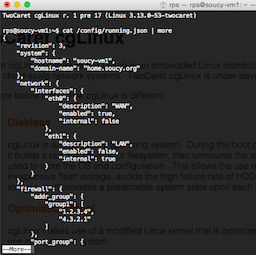 TwoCaret cgLinux is under development. cgLinux is an in-memory operating system. During the boot process it builds a ramdisk for its root filesystem, then unmounts the storage used to store the OS and configuration. This allows the use of inexpensive flash storage, avoids the high failure rate of HDD storage, and provides a predictable system state upon each boot. cgLinux makes use of a modified Linux kernel that is optimized for use as a network system. cgLinux makes use of a unified, human-readable, configuration file for all system and service configuration. This allows for system configuration to easily be backed up, replicated, or scripted for large-scale deployment. cgLinux implements a JSON-RPC inspired API over HTTPS. The user interface makes use of this API to configure and manage cgLinux powered systems. Because the user interface and API are separate, cgLinux powered devices can easily be managed remotely using a custom interface for large-scale deployments. cgLinux makes use of a modular architecture to allow systems to be built quickly for specific roles using reference modules as a base. This makes cgLinux well suited for systems as simple as a network storage appliance or as complex as a multi-function firewall. Unlike most embedded Linux distributions, all cgLinux code is licensed under the GPL. TWOCARET ® and the TWOCARET logo are registered trademarks of TwoCaret Inc.